Another birthday in the cookingfanatic household means another cake. 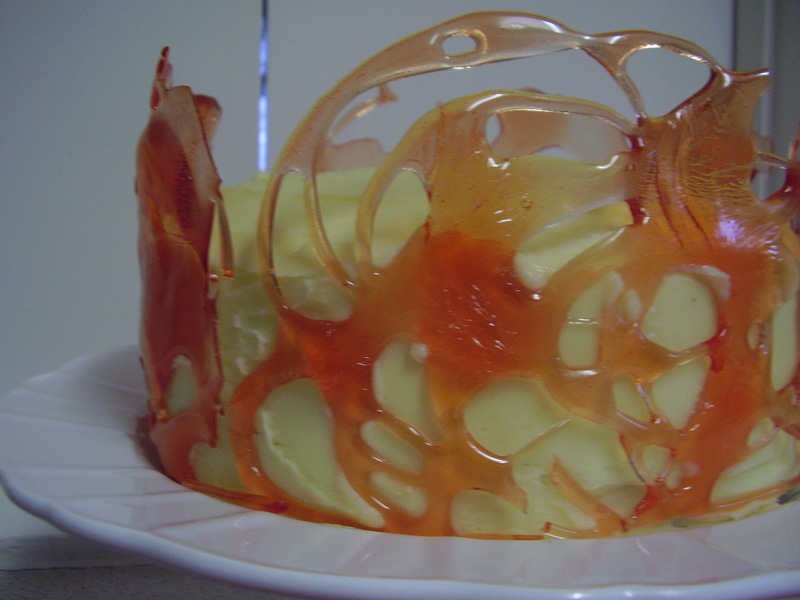 This time it’s the Graffiti Cake from Lorraine Pasale’s Home Cooking Made Easy. I’ll have to make it again next year to complete my challenge but the added practice can only help! I pretty much followed the recipe here. So I decided maybe I did have time to cut out some extra circles for future cakes: For a cake with 4 eggs, I’d normally use 8oz of everything else, but I obeyed Lorraine and went with 7oz. Lorraine’s method is supposed to be foolproof so that the mixture doesn’t curdle, but I completely failed. It’s quite difficult to add “a little beaten egg,” that’s my excuse. 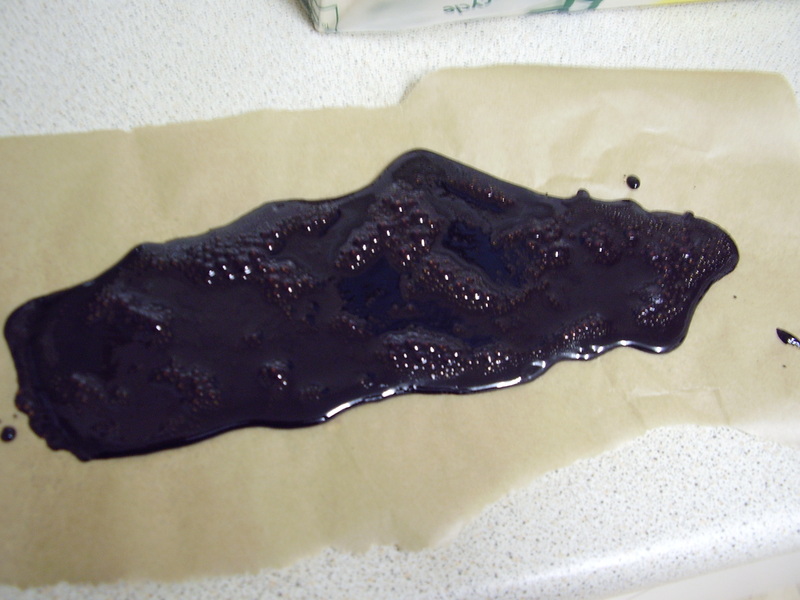 I’d never used sugar syrup on cakes before but it seemed to make it really moist. 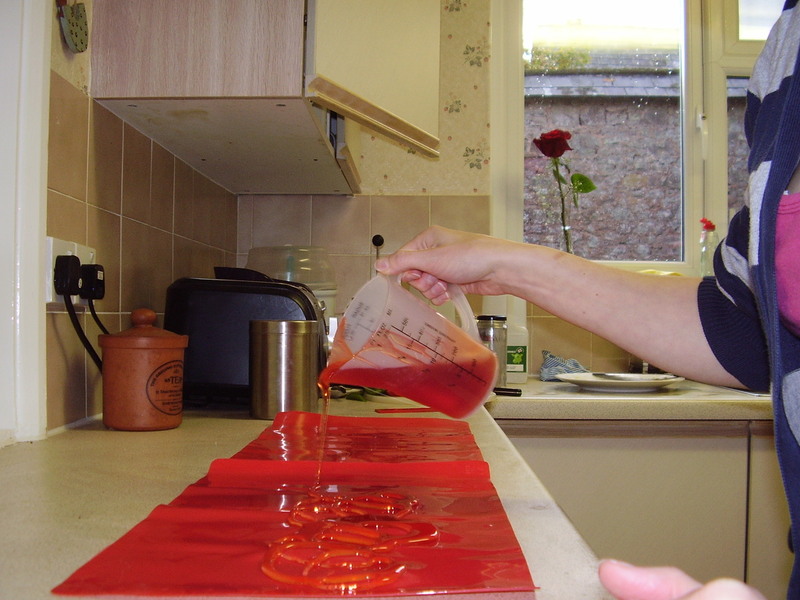 You do end up with lots of syrup left over though, so you probably ought to halve the quantities. Once the cakes were done, I got on with making the butter icing. It requires a lot of icing sugar. It barely fitted into the scales! Then it was time to ice the cake. 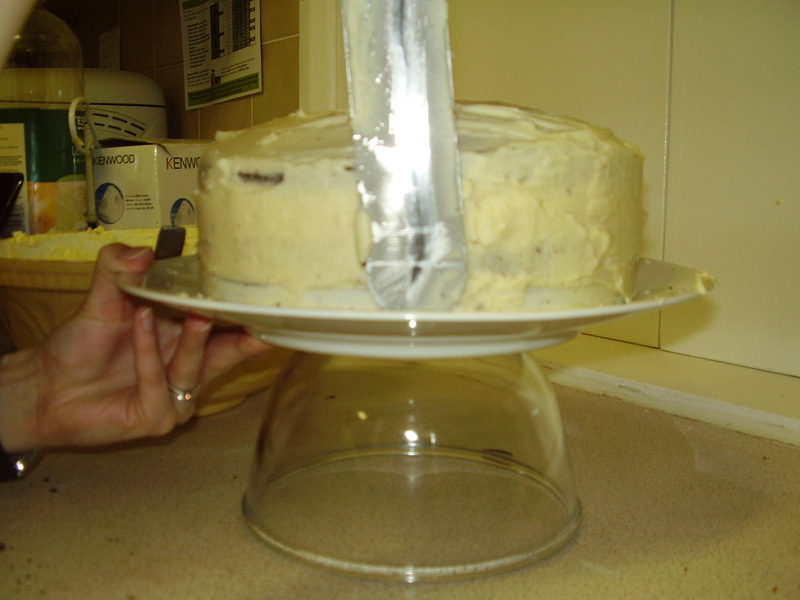 Lorraine uses a cake turntable “but a plate on an upturned bowl will do just as well.” “just as well” would be pushing it – I nearly lost the cake a few times. But all was well in the end, so on to the graffiti. 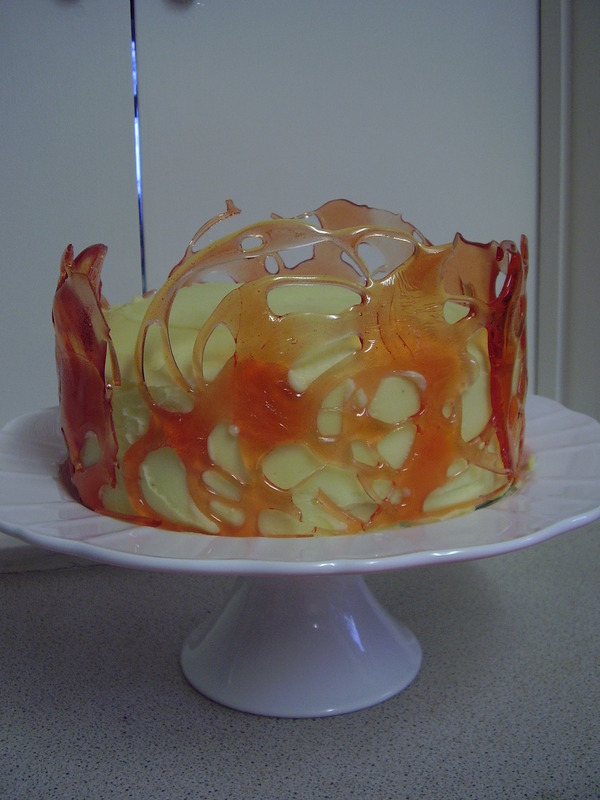 I used a mixture of liquid glucose and golden syrup because it requires just more than 1 Dr Oetker tube of liquid glucose. 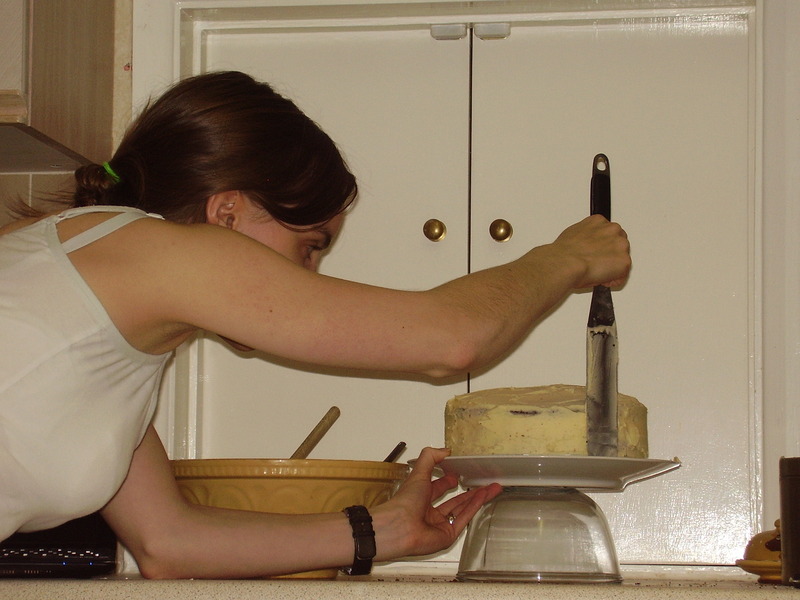 – measuring the height of my cake with the “kitchen ruler” (this is a specialist cookery item with notched edges which can be found in most stationery stores. Mine has the slogan “Don’t play with matches or lighters” but an un-sloganned ruler will be fine). I did a test of making the graffiti the day before but I got distracted so this is what I ended up with: One of the joys of baking, as displayed by Lorraine is that often there is dead time where you can shove something in the oven and get on with checking your emails, chatting on your mobile, or generally posing around the kitchen. 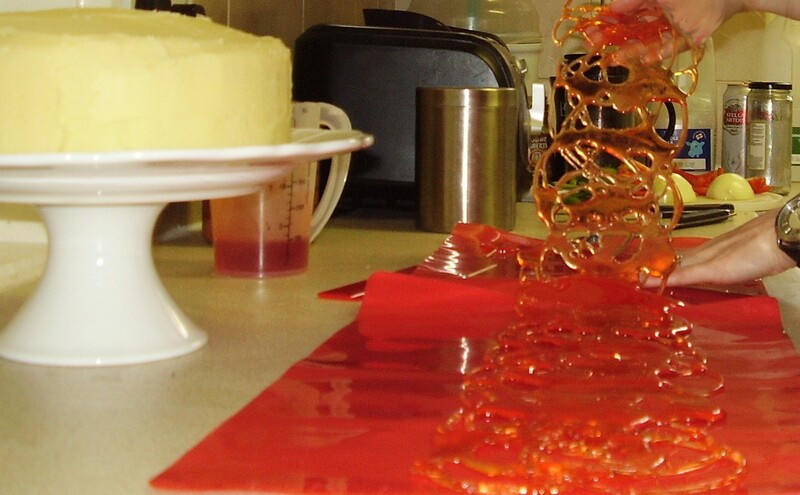 Unfortunately, making toffee requires constant vigilance, so no posing during this part of the cake. If you can avoid having a screaming baby in the kitchen at the same time, that would also be good. 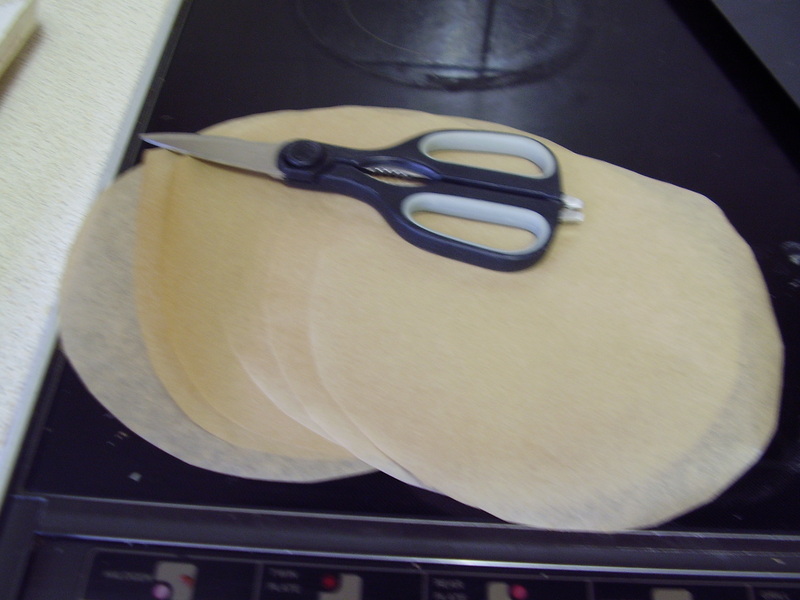 – pouring out the toffee onto my non-stick silicon mats (£3 each in Morrisons). 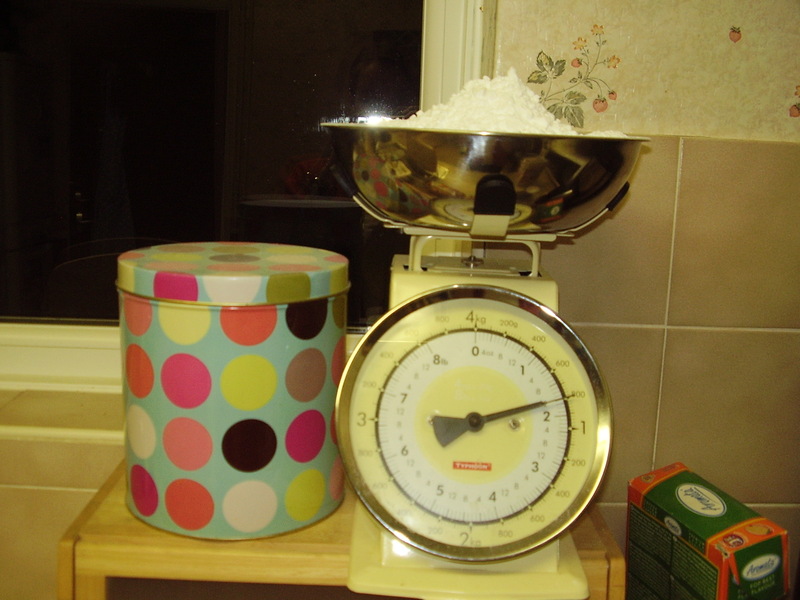 I had measured the height of my cake (about 3 inches) and using some handy Maths calculated that a cake of diameter 8 inches would have a circumference of about 25 inches. So I made my graffiti that size (the mats have rulers on the edges so no need for the kitchen ruler here). – peeling off the graffiti. On the TV show, Lorraine makes it look like you need to do it pretty immediately, but it actually takes at least 10 minutes to get to the “set enough but not too much” stage. It was much easier than I expected to wrap around the cake and then I trimmed the end with scissors. 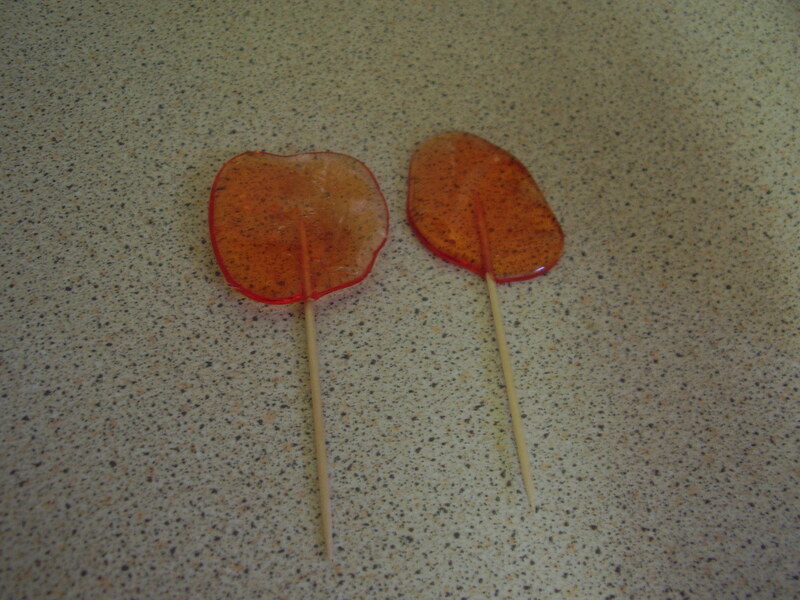 I had quite a bit of toffee left over, so like Lorraine I made some lollipops! I have to say the cake looked pretty awesome and tasted good too. It was definitely one of those “how does she do that?” moments (for fans of Muppet Treasure Island). However, the graffiti is really difficult to cut through, and quite difficult to eat. But it’s definitely a visual feast. I made it again in 2012 – see the post here. Hey there, You’ve done an excellent job. I will certainly digg it and individually suggest to my friends. I’m sure they’ll be benefited from this site. I hope it goes really well – I’m sure you’ll wow everyone! It’s my hubby’s birthday next week and I was thinking of giving this cake a go but I have a question. 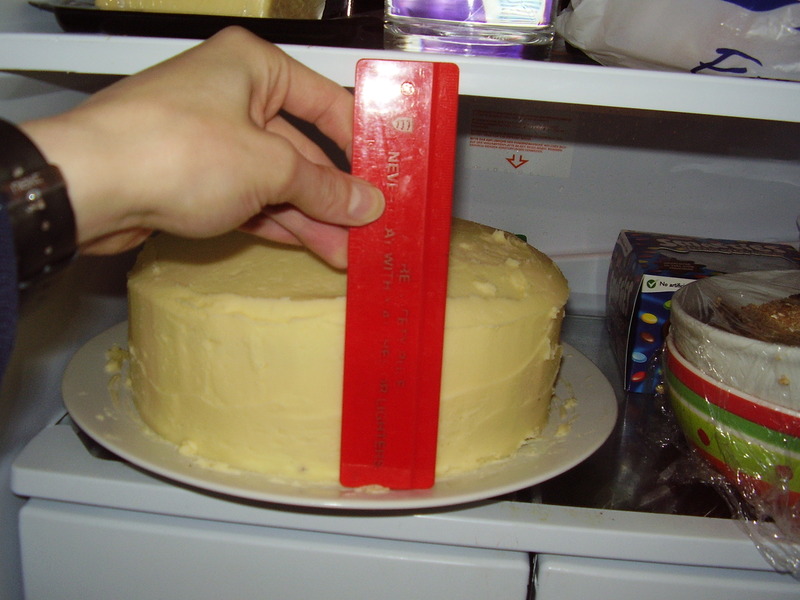 What tine size do you need for the cake? It doesn’t say in the recipe and I’m not a confident enough baker to just guess. 8inch (or 20cm). Hope it goes really well! Yes, the cake could be a bit boring. You could add some jam in between the sponges, or you could flavour the sponge with chocolate or lemon. About the graffiti – if you make it thin enough you can cut it with a sharp knife (if you hit it sharply!). I sort of served each piece of cake with a piece of graffiti which I broke off. Hope that helps!